This is Green Knuckle Material. They hail from Bergen County, New Jersey. According to their press release, they are a time traveling entity who was split into five people by their arch enemy. 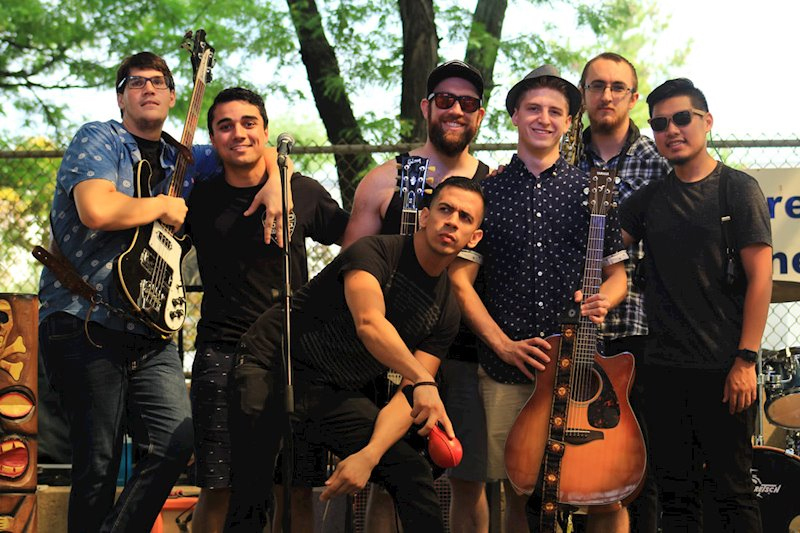 Radio friendly and generally conveyed with thoughtful smiles, the five songs found on the “Renaissance” EP bounce along with an indie rock flair, brought up with occasional horns or subtle keyboard moments. When the band gets quiet and introspective, strong acoustic song writing supports the music as much as the dichotomy of clean vocals backed by a consistent rap presence. The affair opens with a smooth acoustic and a balmy bass with ‘Lullaby‘ carried by some sweetly sung vocals that build toward the rap break in the middle. This back and forth of vocals is a key element to Green Knuckle Material and serves the definition of their sound and delivery. The second track, ‘Soon As‘, arrives with an upbeat, dance-able invitation and a smile. Reminiscent of Citizen Kane or Dial 7 (look them up), the band hits well when they turn up the excitement level. ‘Hole‘ cracks with a dirty fuzzed out alt-rock punky grunge-laced approach. The song is still accessible with keyboard leads and loud/quiet guitar showdowns. However, the song could lose the ‘la la la la’ vocal quips and be stronger for the omission. ‘For The First Time‘ finds rap verses against a softly plucked acoustic guitar, saving the sung vocals for the chorus and second verse. 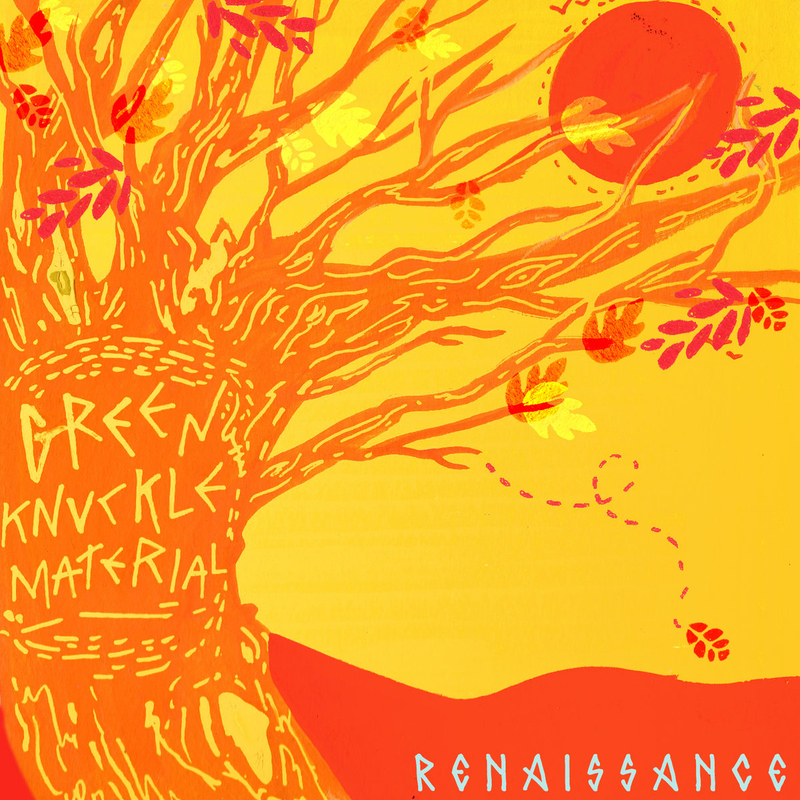 Green Knuckle Material play with this rap vs singing dynamic often with Young Dan on guitars with the sweet voice and Scatterbrain spitting out the competent rap. Every song on “Renaissance” clocks in under three minutes except for the melancholy closer ‘Pictures‘. Somber jazz-laced horns and a slight reggae undercurrent with parts of the rhythm create a warm breeze to sway to on a beach somewhere. There is an overall ‘nice-ness’ to Green Knuckle Material. Perhaps it’s the sweet vocals, or the rap that shoots for flo way more than aggression. Maybe it’s the warm guitars, the smooth horns, or the gentle groove of the bass… it’s all these elements coalescing into the wandering stream through the sunlit valley that is GKM. It’s this shining presence that allows the band their own voice within the ‘alt rock rap’ label with which they are saddled. Sublime knew how to play to the strengths of this approach and when the Chili Peppers traded in their manic tempos for easy-going fluid rhythms, they sold millions of albums. The rap delivery thrown against the candy clean sung lyrics is a formula that seems to have had its day in the past, but Green Knuckle Material (awkward name) does bring their own sense of soul and a heightened awareness of layering and composition of the numerous elements they weave into their more complex numbers. The harder they hit it, the more like-able it becomes. As long as they stay away from the rap-metal hybrid and stick to the alt-indie-rock that jacks small flourishes of reggae and ska for the musical foundation, they should be able to continue to develop along a path that has been laid out before them, but is still open to bands with this level of overall talent.